This entry was tagged cooking, Food, fudge, recipes. Bookmark the permalink. Very easy to make, yes. sure my next guests will enjoy them. Thanks for the recipe. Yum, one of my favorite combo’s – chocolate & peanut butter. I was given a brownie recipe half s lifetime ago using similar ingredients, and although I can’t eat a lot of sweets I break it out from time to time. The peanut butter flavour is quite subtle in this, but you could always adjust it a bit, to your taste. Hello Marianne This recipe looks lovely, I am going to try it soon. I wanted to tell you about a wonderful Musician that we heard yesterday. We are on holiday in Sydney. Yesterday we were walking in Hyde Park and heard Spanish Music. There was a young man sitting by the fountain playing Spanish Guitar. We stopped to listen for a long time, it was delightful; transported us back to Spain. His name is Tom Ward. I wondered if any of you have heard him play? How wonderful to have heard Spanish music in the middle of Hyde Park! Can’t say I’ve heard Tom play – I wonder if he has any videos posted onto YouTube? I just KNOW you’ll love it! Oh, you KNOW so right! I know I will too. Hubby and I are going to fight over this! LOL! UH – OH! Don’t want to cause any marital strife! Hi Marianne, I was new to blogging last year and I guess I have explored hundreds of different blogs over the year – people who live in Spain, writers, photographers, foodies, book reviewers and some I struggle to define! That’s a lot of reading. And you too have read my blog, in its first year, when I was finding my way. So as a big THANK YOU for your support, I’d like to nominate you for the Dragon’s Loyalty Award. Thanks so much for thinking of me, Sandra. I’m honoured. You weren’t kidding about that Marianne. I can taste them! I’m sitting here munching on pecans and almonds. That fudge would just top this little snack right off!! You do understand that even we men are on diets after Christmas don’t you. I salivate so much when you pass out the recipes that I have to wear a bib before logging on to my messages. Go on, give it a try – YOU KNOW YOU WANT TO! Oh I want that! I suppose I’ll have to make it myself. I’ll let you know if and when I do. Fantastic photos Marianne! OH yes – please do, Trish. These were the very first photos I’ve taken with my new DSLR Nikon D3200 camera. So much to learn! 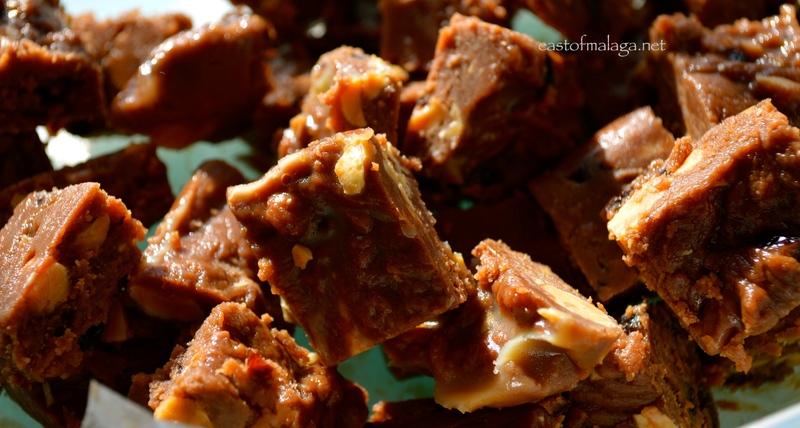 I love fudge and used to make it but daren’t now as I have no will power! AH … now that’s the problem. If only there was an easy recipe for that, Gilly! It does sound easy, Marianne. Thanks! Darn it all….you put on this recipe the very week I weigh myself after the Xmas festivities!!! Well, I haven’t made it other than in a microwave – but it certainly bubbles in there – so I would say try it in a pan (rather than a bain-marie) with a low light and just simmer it. Yes drooling as I type! Not good for the keyboard.